When roses grace the borders in your garden, you&#x27;ll be &quot;wowed&quot; by the results. In addition to blooming drifts of color, roses fill borders with sweet fragrance. What kind of roses work best in a border? What other plants compliment roses? Follow these design tips and prepare yourself for a border that will send your senses soaring! Site considerations: Level surface, full sun, drip irrigation preferable, average soil. 1. Roses Whether accenting garden paths and walkways, or a sprawling flower bed, roses make perfect border plants. The key to choosing the right rose for high profile spots like borders, is paying attention to height . The best roses for borders are from 3 to 4 feet tall--the perfect height for inhaling its sweet, aromatic blooms. Shrub roses, floribundas, and many antique roses work great in borders. Remember to check the hardiness of individual roses, as well as its spreading habits. 2. Sage advice To make a graceful transition from rose blossom to ground level, turn to herbs for sensational planting partners. Tricolor sage with white, green, and pink foliage is the rage in gardens. It grows 12 inches tall and is a perfect mate for roses. Its earthy fragrance won't compete with the sweet scent of roses. 3. Pleasing Parsley With thick, dense, and dark green foliage, parsley completes this aromatic trio of plants. Curly parsley is about the same height as sage (12 inches), but with frequent trimmings (it compliments just about every recipe), parsley tends to be a bit shorter. Plant it on the outer edge so it will be easier to snip. 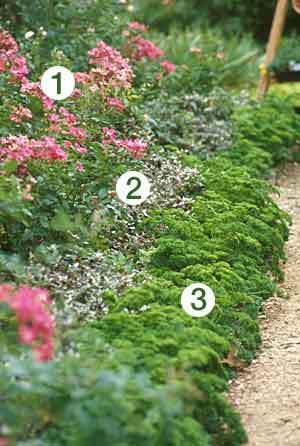 Need a little help deciding exactly which rose to use in your border? Here are a handful of great roses that will shine in borders. 'Golden Unicorn', 'Carefree Wonder', 'White Meidland', 'Rockin' Robin', and 'Knock Out'. Try miniature roses if you want a low-growing magnificent mini for the very edge of beds and borders. You can't go wrong with 'Santa Claus', 'Cupcake', 'Gizmo', 'Space Odyssey', 'Winsome', 'Starina', and 'Lemon Drop'. I&#x27;ve never thought about putting parsley at the bottom of the roses -- I have a lot of roses. I think I&#x27;ll try that this year; I&#x27;m forcing myself to go a little bit vegetable-like, and this could be a good idea. In my tiny garden I think I have 20 roses, including a hedge of Rose de Rescht. Thanks for the idea! I think it is really fun to try and mix it up- instead of having an all herb garden, or all veggie garden or all rose garden it is more fun to have a array of different stuff... the challenge is remembering where you put it all!